As we approach the 20th anniversary of the 1998 political agreement- signed on 10 April or Good Friday 1998 there is an understandable interest in how the economy has performed over the last 20 years. It is fairly easy to establish that the economy has grown since 1998 and the population is bigger (some of that growth caused by in-migration). However, some of the upswings pre-dated 1998 (the political agreement may sometimes have consolidated trends which were already in place). 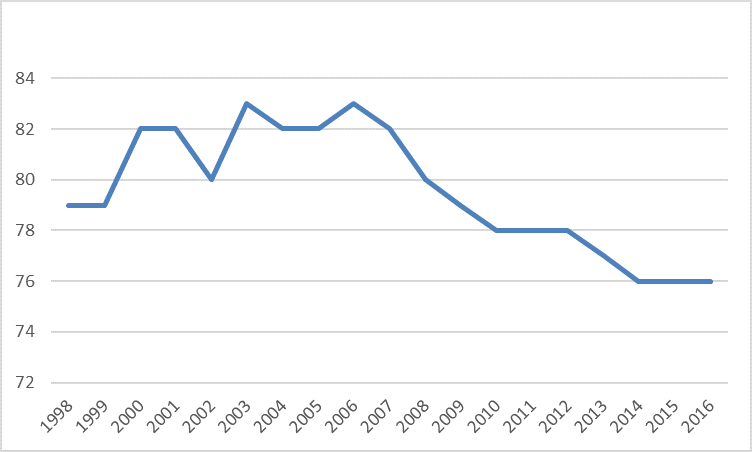 There was an ambiguous record in terms of the relative performance of the Northern Ireland economy as measured by living standards and productivity over the last two decades- catching up on the UK average until about 2007 but falling back after 2007 (and falling back even more compared to the Republic of Ireland). Other factors such as the 2000-7 Blair-Brown boom in public spending and the global recession in 2008-9 may have been much stronger economic drivers than the 1998 Agreement per se. It is often argued political uncertainty is damaging to business investment although the strength of any such effect remains unclear. During 1998-2018 we have had more political stability than during the period of the Troubles (less violence). However, during the last 20 years we have also had stop-go government and most recently 400+ days of “no government”. The creation of the devolved institutions during 1998-99 provided an opportunity to tailor policies to the particular circumstances of Northern Ireland in an appropriate manner. On the whole, that opportunity was not grasped. 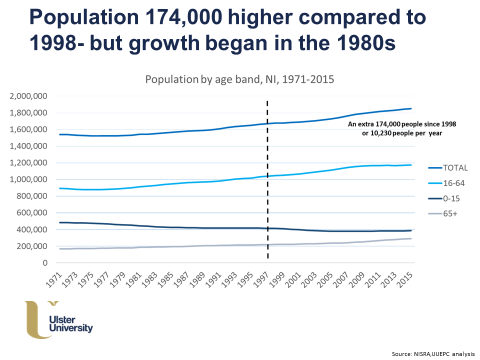 One indicator of this is that Northern Ireland’s population has grown considerably adding 174,000 to the total between 1998 and 2015 [see Graph 2 at end of Release]. Moreover, for a time, the previous historical trend of being a net exporter of people was reversed. A much higher percentage of the population now comes from outside Northern Ireland; positive net immigration added 35,000 people during 1998-2015 [see Graph 3]. Not only are there more of us but on average we are living longer. Those of us of working age are more likely to be employed and more people are working in high productivity service and manufacturing sectors. Participation rates in university education are also higher than it was in 1998. This all leads to higher wages and incomes compared to 20 years ago. Albeit earnings growth was concentrated in the 1998-2007 period and then interrupted by the banking crisis. 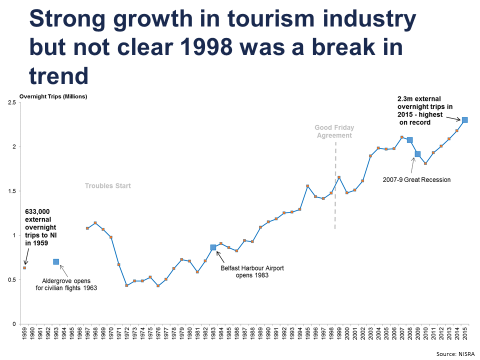 Northern Ireland is also a much more attractive place to visit, with tourism numbers rising almost uninterrupted [Graph 5] and significant investment in the hotels sector across Northern Ireland is now underway. If one looks at indicators such as population growth, employment or tourist numbers, the turning points in performance appear to come before 1998. The political agreement may have consolidated an established trend, which would have commenced after the end of the early 1990’s recession and given a significant boost by the calling of the 1994 ceasefires. Other factors will also have played a very significant economic role including the very rapid growth in public expenditure during the Blair-Brown years and the impact of the banking crisis during 2007-8. And the late 2000s were also shaped by the bulge in in-migration and the house price bubble [graph 4]. 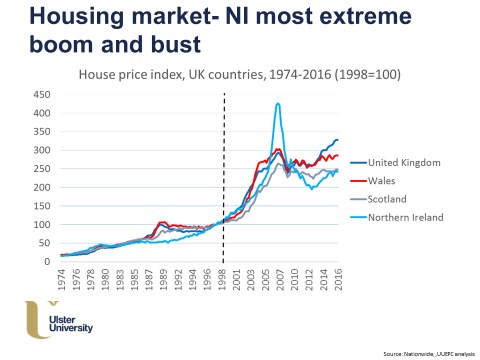 Twenty years on and significant performance gaps relative to both the UK and Republic of Ireland averages still persist. Notably relative GVA, or economic output, per head is a few % points less than the 1998 levels (see graph). Conditions improved in the early years, but the financial crisis had a much greater impact locally than nationally. It is also important to recognise that the process of re-balancing the economy to be less public sector reliant has also occurred and would not be reflected in the headline economic indicators. Such stability may matter to business but it is far from obvious how much extra stability the Agreement delivered. (However, it would also be reasonable to ask if the period from 1969-98 delivered political stability?) Devolution did not operate continuously throughout the twenty years. It was stop-start during December 1999-October 2002. The mid 2007-Jan 2017 period of operation was marked by three periods of political negotiations. And, for over 400+ days now we have really had “no government”. Given the many persistent economic challenges locally, it is reasonable to ask if the Executive took full advantage of its devolved powers. In the post 2007 period, it developed “super parity”, which is a relatively low level of taxes and charges compared to GB. There were many fiscal “give aways”, which in the current environment may no longer be sustainable. But have many of these policies really helped the economy? Another discussion point could be the devolution of Corporation Tax, but the implementation of this policy at this time remains highly uncertain and conditional on a restoration of Stormont along with budget sustainability. In conclusion, the economy and individual prosperity has improved since 1998, but the evidence would suggest that devolution may have been more important at a political level than an economic level. That is not to deny a counterfactual of “no agreement plus violence” could have produced worse economic outcomes, but any future local administration must be more bold in the economic policies it should pursue.